Slots.lv is an online casino site specifically tailored for Canada and North America. Established in 2013, it has offers over 400 video slots and table games from multiple software providers, including Bodog Custom, Real Time Gaming and Rival Gaming. While it was once a decent online destination for Canadian and American players, we advise anyone from both regions to look elsewhere given its termination of its previous Kahnawake gaming license and below average games selection. This review takes a look at what Slots.lv has to offer in bonuses, promotions, regulation, customer support, payment methods and security, and lists better alternatives. Does Slots.lv accept players from the US? Yes, Slots.lv online casino is geared towards players from North America and accepts sign ups from all states, with the exception of anyone residing in Quebec, New Jersey, Maryland or New York state. If you live in one of those states, unfortunately you are unable to gamble online here. Slots.lv Casino have two major bonuses in-place for new players, supplemented with a smattering of “limited time” promotions that actually repeat more often than not. 1. Welcome Bonus: Available to all new players who sign up for an account, deposit and claim up to $5,000 in matched deposit bonuses. For your first deposit, enter the promo code ‘HELLOSLOTS200’ during payment to claim a 200% matched bonus up to $1,000; for the subsequent eight deposits, enter the promo code ‘HELLOSLOTS100’ during payment to receive a 100% matched bonus up to $500. If you deposit the maximum each time, you can have a seriously full account balance to kick-start your play-time at Slots.lv. 2. Bitcoin Welcome Bonus: Available to all new players who sign up for an account or existing members, deposit using bitcoin cryptocurrency and you can claim up to $7500 in matched deposit bonuses. It works similarly to the welcome bonus offer – just enter the promo code ‘SLBITCOIN300’ during your first bitcoin payment and Slots.lv will match your amount 300% up to $1,500. Then, use the promo code ‘SLBITCOIN150’ at the cashier for the next eight deposits to receive a 150% match up to $750. Seeing as bitcoin isn’t commonly available at many online casinos, this is one area where Slots.lv has a unique advantage and it undeniably offers some great value should the player deposit the maximum each time. Initial impressions with the site coming off the bonus are high given the immense value you get here compared to other sites, and the attached 35X wagering requirements on each bonus are actually quite low compared to other sites. However, the risk is, as mentioned before, depositing and playing at a site with no active licensing from a trusted worldwide regulator. If you can look past that gaping hole, or are confident that Slots.lv’s previously good standing in the online gaming community is enough to continue, it’s an option – but admittedly, not a great one. Slots.lv have the standard refer-a-friend promo running, where for every fellow player you sign up via your link, you will get $200 in their account. They also have a loyalty program called ‘MySlots’ which grants rewards points for every bet you place and deposit you process, split into eight tiers and ending in VIP level with some added perks, including bigger maximum deposit and betting limits and other freebies. It’s not as extensive as other top-rated casino sites we recommend, and it’s a slow crawl to the higher levels with any worthwhile rewards. 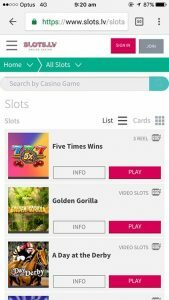 Slots.lv online and mobile casino currently has over 400 slots and table games in its catalogue, the majority of that number also playable on mobile. Its current software providers are Bodog Custom, Real Time Gaming and Rival Gaming, which are some of the only studios offering games to American and Canadian real money players. They once had BetSoft games, which is arguably one of the world’s best studios at the moment, but at the time of this review, Slots.lv have dropped them from their catalogue. Compared to the type of games software available to players from other countries, these titles are, quite simply, bottom of the barrel stuff in terms of entertainment, payouts and quality. Unfortunately, it’s all that CA and US players have at the moment, so if you’re okay with playing below-average to average blackjack, roulette, poker, slots, and other niche games with dull aesthetics and simplistic gameplay and are more focused on just winning itself, this won’t bother you as much as it did for us. 1. Slots: Over 200 games from Rival and RTG, including A Night with Cleo, Caesar’s Triumph, Five Times Wins, Major Moolah, Rise of Poseidon and Sevens and Bars. 2. Table Games: Over 20 games from Bodog Custom, including baccarat, blackjack, craps, Let ‘Em Ride and tri card poker. 3. Video Poker: Over 15 games from Bodog Custom, including Double Jackpot Poker, Double Double Bonus Poker, Jacks or Better, Joker Poker and Loose Deuces. 4. Specialty: Over 21 games by Bodog Custom, including bingo, keno and sudoku. 5. New Games: Displays all new releases at Slots.lv. 6. Exclusives: Displays games supposedly only available at Slots.lv. 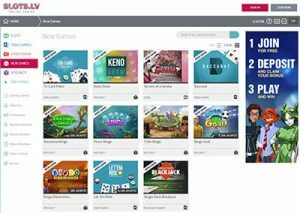 Slots.lv is, like most modern-day casino sites, available to play on desktop, mobile and tablet devices instantly because it is a no-download casino (also called instant play) venue. This means you can load up the site and play its games directly in your device’s Web browser (all you need is an Internet connection) without the need to actually download and install special software. In this regard, the site performs decently and scales well to the smaller, touch-based screens of our Androids, iPhones and iPads. General site navigation is speedy, the menus are neatly laid out and everything about the interface generally feels polished and modern. It’s just a shame, then, that the available games selection on offer at this time is so mediocre. It is concerning to read reports and reviews from other players regarding the software at Slots.lv freezing up multiple times during gameplay, messing with players winning bets and payouts. Whether it is an individual connection problem or something more widespread across the site cannot be confirmed at this time. Slots.lv currently accept bitcoin and credit cards with Visa branding as deposit and withdrawal options. For Canadian players, you also have one additional option over US-based players, and that is direct bank transfer – which we recommend for its proven safety. Compared to other top-rated online casino sites, the list of payment options at Slots.lv is pitiful. We have taken into account that the list of countries they accept is extremely small compared to other casinos who cater to a worldwide audience, but the fact that no virtual wallet services (Neteller, Skrill) or pre-paid cards and services (Entropay, Paysafecard) are supported is a little baffling. Customer service representatives informed us available deposit options depend on the player, and that sometimes Mastercard is accepted, but it is conflicting information from what is presented on their site. Slots.lv seem to push bitcoin as their preferred deposit option from players, given they have all sections dedicated to explaining what it is and how to fund your account with it – compared to little to no documentation for other supported payment methods. The minimum deposit amount is $5 at Slots.lv and the minimum withdrawal amount is $20. All players must take note: Getting your winnings sometimes takes 72 hours or more to process, and you have to have your account verified before you are allowed to do so – though the verification process only took between 24 – 48 hours in our testing experience and only required basic documentation (license) before we were cleared. We have noted from reading other player reviews across the Internet that Slots.lv has made the withdrawal process extremely difficult for many players who have won big, and that is a major concern we have and one reason why we aren’t exactly recommending them so highly. Curiously, those who used bitcoin exclusively reported very prompt withdrawals. We have mentioned throughout the review that Slots.lv’s previous gaming license is no longer in place and that is the main reason why we cannot champion the few things it does right. For those unaware, Slots.lv once held a legitimate gaming license in Kahnawake and was regulated by the Kahnawake Gaming Commission, a recognised online gaming jurisdiction that maintained oversight over many online casinos catering to the United States. However, Lynton Limited, Slots.lv’s parent company, voluntarily terminated its license with the Kahnawake GC on September 1, 2016. This information was not readily announced and many players found out only after a bit of digging, and what’s worse is Slots.lv did not immediately seek new licensing from another trustworthy gaming regulator, meaning it has no legitimate oversight or auditing to keep them in check. Players also don’t have a regulator to turn to when they have potential problems with Slots.lv, meaning they’re out of pocket if the casino decides to not pay out. The Kahnawake Gaming Commission reportedly wrote to operators it licensed that they needed to stop accepting American players by December 31 (due to regulatory changes), so perhaps Slots.lv departed from their jurisdiction due to that. Regardless, without any new licensing that we are aware of, we cannot currently recommend Canadian or United States players to play at Slots.lv, even if the current options available to you are limited due to local gambling laws. This review remains for record purposes only, or until the site receives new licensing and we can go over their games and features once more. Our team at TopOnlineCasinoSites.com covers and reviews dozens of the best online casinos, catering to players from around the world. Visit our top casino reviews page for more information on which site best suits your needs adheres to your local gambling laws. Visiting us from United States and don’t know where to begin? One recommendation we always can make without hesitation is Raging Bull Casino, thanks to its incredibly generous welcome bonuses, regular competitions and promotions, hundreds of real money online games from the world’s best software studios and safe, legitimate licensing.